Available in 6 and 12 watt LED. Perfect for applications where highly efficient low levels of direct illumination are desirable. A wide variety of front panels are available. Tamperproof and vandalproof units are available. Gasketed for dust, moisture, and insect-resistance. 20-gauge steel for rigidity. Also available in aluminum and stainless steel. 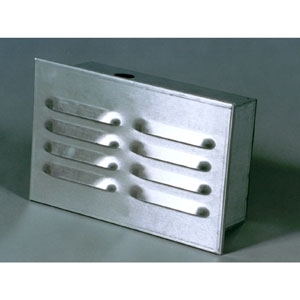 20-gauge steel louvered face is standard. Also available in optional open face. 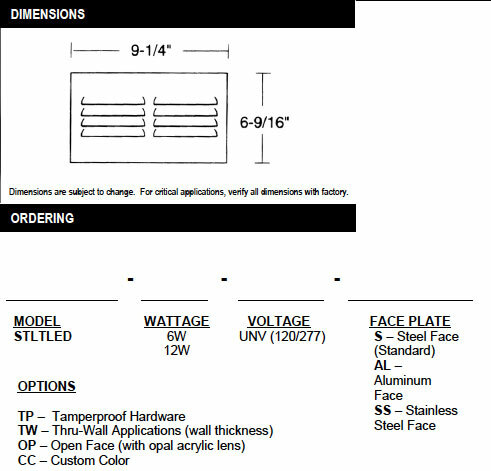 Face plate also available in stainless steel or aluminum. Highest quality driver, emitters and power supply for long life. Optional open face comes with opal acrylic lens as standard. Consult RLE for other lens options. Baked white enamel faceplate is standard.